SACRAMENTO, Calif. (CN) – California’s housing crisis and lack of viable public transportation could deliver the one-two punch that prevents the state from meeting its lofty clean air goals, a new report warns. The California Air Resources Board joyously reported four months ago that California was four years ahead of schedule in its quest to cut smog, but now predicts the state will miss its world-renowned climate change mandates if its largest cities don’t start building affordable housing and public transportation. 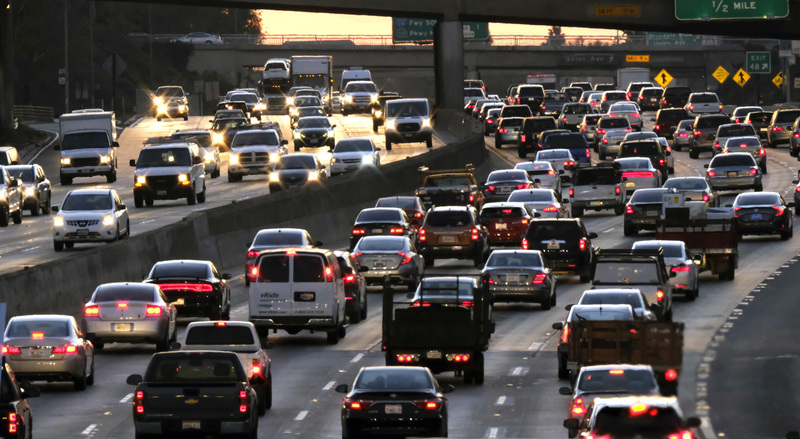 “California is not on track to meet the greenhouse gas reductions expected [by 2020], with emissions from statewide passenger vehicle travel per capita increasing and going in the wrong direction,” the board found in a new report. Spurred in part by a recent two-year stretch of wet weather which produced a spike in available hydroelectricity, the board announced in July that the state was well ahead of a mandate to reduce greenhouse gas pollution below 1990 totals. The agency attributed much of the success to an increase in solar energy generation and a drop in natural gas use. Gov. Jerry Brown and state officials patted Californians on the back for reaching the Global Warming Solutions Act signed by former Republican Gov. Arnold Schwarzenegger. “The next step is for California to cut emissions below 1990 levels by 2030 – a heroic and very ambitious goal,” Brown said of the July report. But in Monday’s more sullen update, the board implores 18 metropolitan regions to step up and help cut greenhouse gas emissions by giving residents new housing and transportation options. It says Californians’ commutes are lengthening and that even putting more electric and fuel-efficient cars on state freeways won’t suffice. “While California has grown to be the fifth largest economy in the world, with world-class cities and thriving communities, its residents, in search of an affordable place to live and with insufficient transportation options, are too often left with little choice but to spend significant time and money driving from place to place,” the 96-page report states. In an effort to codify Schwarzenegger’s mandate, lawmakers in 2008 passed a bill requiring the board to work with city planners to establish individual greenhouse gas emissions targets. The cities were expected to develop and begin implementing alternative transportation and housing projects that help residents to drive less. Ten years later, the first-ever progress report gives the 18 metro regions a failing grade. An estimated 75 percent of commuters are driving alone to work while transit ridership has fallen in recent years, according to the report. The report says each level of government is partly to blame for the lack of housing and paltry progress on transportation and that the state should improve incentives and funding for projects that provide housing near jobs, transit centers and low-income communities. In addition, state and local officials should be studying travel habits and relocation trends. It also suggests lowering transit rider fees and raising parking costs in high-demand areas to encourage less driving. “In order to see greater results in the future policymakers need to better understand what has happened over the last decade,” the report continues. Environmentalists said the report is a call to action for California planners and lawmakers. With the board and the California Transportation Commission scheduled to discuss the report in December, Joshua Stark of the public transit advocacy group TransForm hopes the regulators will “look forward” when it comes to allocating transportation funding. “The Legislature and state agency leaders need to focus more of the state’s transportation dollars on meeting our climate goals,” Stark said.